A wonderful addition that should be of great assistance to those living in the downtown especially! 1. Opening at 401 9th St (corner of 4th Avenue and the revamped 9th Street), it is called The Downtown Depot. 3. It will also be a sundry store -- selling aspirins, etc. to downtown residents and workers. 4. It will open in mid April 2007. Article information: "Downtown Depot to offer W.Va. crafts, By Jean Tarbett Hardiman, The Herald-Dispatch, Saturday, April, 7, 2007"
The good news for the downtown keep rolling in! On top of the Love's Hardware renovations (into lofts for the upper floors and the removal of the hideous exterior cover) and the Stone and Thomas renovations (into condos)... now you have these high-end condos. 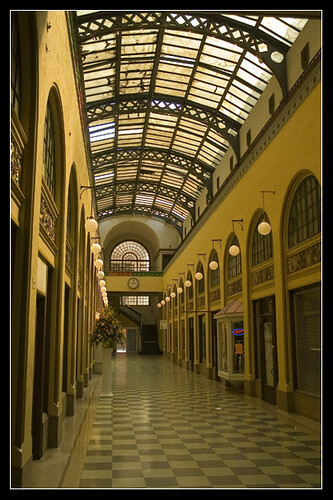 The Galleria is the Huntington Arcade. 1. The owner is a 30-year old businessman who has a 'vision' for the Galleria. The vision includes the implementation of a lifestyle center, where people can 'come and have drinks and appetizers, do some shopping, and get your nails done.' He envisions it as a mini-Pullman Square. 1a. The Huntington native owns RE/MAX Professional Advantage and is the property manager of the Upper Classman and Thorntree Apartments -- and formerly of the Emmons Jr. apartment building. 2. When he purchased the building in October 2005, it was 60% occupied. Today, it is nearly full. 2a. New tenants include Dianne's Merle Norman, Dianne's Wigs and LuShaley's salon -- all owned by Dianne Hutchison. 2b. Club Luna is set to open soon. 2c. Will Cragg's Franklin Outfitters (outdoor shop) opened on March 1 and has already outgrown its space -- and moved elsewhere in the Galleria. 2d. Existing businesses include Laine's Eclectic Boutique and Gifts, tax attorney J.K. Harris, Aflac insurance and Yellow Book. 2e. Older businesses include The Peanut Shoppe, George's Tailoring, Publisher's Place, Ceal's, business consultant Tom Harris, World of Dolls, Voodoo Paintball and the HuntingtonNews.Net sales office. 2f. Linda Goldenberg is moving an arts and crafts store from the Heritage Village. 3. Portions of the building date back 100 years. Part of it was constructed in 1905 and the other portion in 1925. 4. The timing is right -- with new condos, commercial development, etc. going up all over downtown. 5. Renovation work includes the ceiling -- but the contractor who the owner planned to dole it out to is on another large project and is currently unavailable. 6. The demographic profile the owner was aiming for was Marshall Univ. students -- but most have been between 25-45 years of age. Article information: "Galleria in the midst of a rebirth, Herald-Dispatch, Tuesday, April, 24, 2007"
1. The Downtown Depot opened last weekend at 401 9th Street. A grand opening is being held today from 11 AM to 2 PM, featuring the "1937 Flood" band, food samples, and pottery demonstrations. 2. Goodwill owns and operates the store, and gives people jobs there who have gone through the Goodwill's job training program. 3. The arts-crafts portion of the store sells pottery, photographs, glass, candles, soaps, toys, potholders, CD's, etc., along with food products from the state, baking mixes, salsas, and tortilla chips. 4. The market portion of the store sells items that people might need for their 'downtown apartment' or office -- such as fruit, ice cream, groceries, soft drinks, office supplies, and some medicine. Article information: "Grand Opening today for Downtown Depot, By JEAN TARBETT HARDIMAN, Herald-Dispatch [Huntington], May, 3, 2007"
1. 4th Avenue is coming back to life, with a new shuttle bus from Marshall University to Pullman Square that runs through parts of 4th Avenue. 2. A cityscape plan is in the works for 4th Avenue, where the current four-lane undivided road with parking bays would be narrowed to two lanes. Sidewalks would be added, bike lanes would be striped, trees would be planted and new ornamental lighting would be installed as part of the project. 2a. The city has applied for a federal transportation enhancement grant that would match what the city is contributing and would provide $425,000 for improvements to get started. Work would begin at Hal Greer Blvd. and proceed west. 2b. The first phase would be from Hal Greer Blvd. to 14th Street, and would eventually head towards 8th or 9th Street. 3. The work, for now, is concentrating along 3rd Avenue. The city is utilizing leftover funds from a $3 million Tax Increment Financing grant that was used to renovate 9th Street Plaza. Stretches have already been completed, such as in the vicinity of 12th and 13th Streets. 3a. Planned are the construction of angled parking that would add 45 spaces on the 1200 block of 8th Street, and a gateway arch at 3rd Avenue and 12th Street. 3b. Additional landscaping would be done around the sculpture at the Big Sandy Superstore Arena that was moved from the 9th Street Plaza. 3c. The city council approved an extra $300,000 of Community Development Block Grants for the central business district. Once 3rd Avenue is completed this year, work will begin on 4th Avenue. Article information: "City planning 4th Avenue improvements, By Jean Tarbett Hardiman, The Herald-Dispatch, "
Last week, Jesse Wellner, a real estate investor from New York City, purchased Huntington's tallest building for $3.2 million from Huey Perry. The West Virginia Building hasn't changed ownership since 1981, when it was sold for a mere $500,000. Wellner has been looking to purchase the building for a while. Four years ago, he discussed purchasing the rooftop for wireless infrastructure. The West Virginia Building has 41 apartments with 100% occupancy. It has remained full and vibrant since Pullman Square was first opened in 2004. Five attorneys, a psychiatrist, an in-home care service for the elderly, a company that conducts studies for occupational rehabilitation purposes, the Village Collection, and a Verizon wireless store all occupy the building as well. There are currently no plans to change the use of the structure, and rents should remain stable for the short-term. The apartments have all been remodeled within the past 20 years, and all of the businesses are on long-term leases. But Wellner has stated he plans to market the building to more Marshall students and faculty. The West Virginia Building is 220 feet tall and has 15 floors. It is the tallest in Cabell County and the second tallest in the state. It was constructed in 1924 by Robert Archer, a contractor hired by the Union Bank and Trust Company. The bank occupied the building, then known as the Union Bank and Trust Building. In 1943, the building went into receivership and was purchased by a group of Huntington Businessmen. Eddie Kyle, a Realtor and one of the buyers, renamed the structure the West Virginia Building. Eleven years later, in 1954, the building was sold to a New York City entrepreneur for $700,000, only to be sold again one year later to the West Virginia Building Associates of New York for $1.2 million. In 1975, the building was nearly put up to public auction when the association failed to make the final $100,000 mortgage payment. By then, the building had been for sale for a year and there were no interested parties. The downtown area was suffering and it was a fairly bad sign when an association couldn't bring in 10 percent of its original purchase price. Just one day before the auction was scheduled, Dr. J. Evan Sadler, a Huntington pathologist, purchased the building for $250,000. It was sold again in 1981 to Perry-Monroe-Perry Ltd. for $500,000. Here is an article about Huntington's riverfront, where renewed interest is building in expanding its facilities or at least keeping it clean from vandals and the homeless -- who set up "Tent City" right next door. The homeless camp was recently cleared and the grounds cleaned. Part one of the series on efforts to increase the number of people living in downtown Huntington. Byron and Lynn Clercx are ideal downtown tenants: hardworking professionals without children. They rent a loft apartment across 4th Avenue across from the Cabell County Courthouse and adore it. A few times a week, they walk around downtown to appreciate the architecture of the city, meet new and old faces, and visit a new business (at least one a week). It's within walking distance of work, eateries, and Pullman Square, and a five minute drive to the grocery store. The downtown living lifestyle is becoming even more appealing as Huntington continues to gradually revitalize its downtown. Turning the downtown into a thriving residential neighborhood is a slow process, but the city is taking gradual steps in that direction. The Huntington-Ironton Empowerment Zone has done a market study on who possible tenants might be and researched the kinds of changes the downtown needs to be more resident-friendly. It has also worked to expand the downtown's historic district so that developers who put in condos and lofts within the district can get tax credits. The potential size of the market is about 458 units in the downtown without affecting the existing market. Based on a $5,000 market analysis paid for by the Empowerment Zone office, it has concluded that the best tenants would be young professionals without children and retirees. Young professionals flow into the area for jobs at Marshall University and its health care centers, and might likely flow out again if they aren't looking to invest in a large home. The retirees and empty-nesters no longer want the maintenance worries of a house. So far, there is a handful of developers putting in these types of dwellings. One instance of this is the ongoing work on the St. James Building, which is owned by a Florida developer and has sold almost 30 custom condos with more to go. Commodore Holding, comprised of five young professionals in the Huntington community, has four loft apartments under construction in the old Keen Jewelers building along the renovated 9th Street corridor. It is within a block of Pullman Square. And there is the Love's Hardware lofts, being planned by Gary and Nancy Pommerenck. The designs for the lofts that will go in above the hardware store is being worked on currently; it is located adjacent to Pullman Square at 10th Street and 3rd Avenue. But more housing developments won't occur unless a balance of commerce, activity, entertainment, and a safe, pedestrian-friendly environment are achieved. Currently, the city has reengineered 9th Street to two-way traffic and has improved lighting there, which makes it more commerce and pedestrian friendly. It is now working on improving sidewalks, lighting, and parking along 3rd Avenue. Work will begin soon on phase one of the 4th Avenue streetscape project, which will involve the reduction of the road from four- to two-lanes, and the addition of bike lanes, new lights, traffic signals, and sidewalks. Public art will also add to the attraction of downtown, and could create a sense of continuity in different parts of town, from the east end to the west, on the south side and in the downtown area. Parking needs to be addressed as well, which includes dedicated garages for residents, and general cleanup work. One site for parking includes the city's annex building next to city hall, which is currently abandoned. A Community Development Block Grant will pay for asbestos abatement, and the building will then be demolished. Downtown grocers might be introduced at a later date if the population hits a critical mass. Progress is happening in Huntington, and measures that will draw in more residents will be a slow process that may take five to ten years. Real estate records show that between January and August 2006, 12 residential units were sold in the downtown. During the same months of 2007, 22 were sold. The St. James Building at 10th Street and 4th Avenue is the leader in renovating older space in Huntington, marketing one- and two-bedroom custom condos for prices that range from $100,000 to well over $200,000. In the first year and a half, 27 of its 53 units have been sold, making it the biggest contributor to the city's revitalization effort. In the first six months of the year, only two had sold, but picked up after the rooftop deck was and lobby refurbishment was completed. The roughly 100-year-old, 12-story building was bought by Swiss Capital Group of Florida in 2005, and the sale office opened in 2006. The first five floors are commercial space, and the sixth floor and up are residences, complete with a library, fitness center, sauna, spa and rooftop garden. Elsewhere, Commodore Holding has sold three of four units for the upper two stories of 9th Street Flats. It is located in the old Keen Jewelers store, and the first floor will be retail/office space. The lofts are custom-built with a minimum of two bedrooms, and designed in the Soho- or Bohemian-style, with large windows, exposed brick and duct work and hardwood floors. Work is slated for completion in November. Adjacent to Pullman Square, Gary Pommerenck is hoping to have some lofts completed above Love's Hardware next year. He has been working with the Huntington-Ironton Empowerment Zone on efforts to increase the size of the city's historic district as a way of attaining tax credits. As a result, the district is two times larger and his building is the only building on the north side of 3rd Avenue within that district. Gary is in the final phase of getting financing arranged -- which began two years ago. When complete, the building will have four two-bedroom lofts and three one-bedroom lofts. Construction continues along 3rd Avenue as Huntington renovates the streetscape to a three-block stretch of road in the downtown. The third phase of construction is ongoing from 10th to 13th streets along 3rd Avenue, and consists of replacing sidewalks, installing decorative street lighting, introducing various landscape elements, creating more parking, and paving and striping the road. The last major phase is continuing and should be complete by November. Already, 45 angled parking spaces have been created on 3rd Avenue to alleviate parking congestion downtown. The project is being financed federally by the National Empowerment Fund and the Community Development Block Grant, as well as locally with Tax increment Financing bonds. The downtown revitalization project on 3rd Avenue began in 2005. So far, two phases have allowed the city to convert a four-lane one-way road into a two-way road and develop 9th Street. The project has stimulated growth in the area, with seven new businesses locating along the throughfare where vacant businesses loomed for decades. Pullman Square should also take credit, as the city is working with private building owners to convert their properties to other uses and restore their appearances to what they originally were. Every element of the third phase has been approved by the city except for the paving. The city is also working to create a pedestrian archway across 3rd Avenue located midway between 12th and 13th streets, and create a gateway entrance to the center of downtown.